Increase your working knowledge and gain the expertise and credentials to shape regulatory policy at the state and federal levels to improve patient care and outcomes. Stay on the cutting-edge of knowledge regarding patient safety, regulation, risk-management, pharmacoeconomics, and clinical research, and lead your organization in quality assurance and quality improvement efforts. Enhance your knowledge to apply the latest research and policy in your work environment and to improve patient outcomes. Gain an understanding of licensing and accreditation issues impacting health systems. Understand the economics, regulatory policies and ethical concerns to make thoughtful decisions regarding patient outcomes, drug costs and benefits administration. 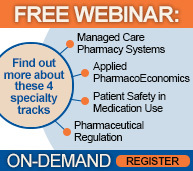 Understand general risk management techniques, standards of health care risk management administration and methods for integrating patient safety clinical risk management programs. Through a greater comprehension of federal, state and local laws, graduates may provide regulatory compliance expertise to the creation and administration of a comprehensive risk management program. The MSPharm program focuses on many areas relevant to the pharmaceutical industry. Whether you have aspirations to pursue a career path in regulatory affairs, or have a desire to shape policy related to medicaiton use, or wish to gain a better understanding of patient outcomes research, our program provides you with the knowledge and skill to achieve your professional goals. Take a leap in your career or move into a new area of practice; open doors with a graduate degree that allows you to focus on your area of interest. If your goals include moving into a regulatory role, adding a specialization to your PharmD or BPharm, taking the lead in patient safety initiatives, understanding the economic considerations to improve health system outcomes, or applying regulatory and ethical considerations to clinical research, consider our program. As a legal professional, you know that health care reform is underway, creating changes and challenges within the health care system. Specialize in an area of health care regulation, policy, or pharmaceutical outcomes by completing coursework online and after hours. Our flexible program allows you to take selected individual courses, complete a 5-course certificate, or earn a master’s degree in as little as two years. Nurses and other health care professionals are assuming important roles in many aspects of the new health care marketplace. Enhanced training and credentials in the areas of health care regulation, policy, and outcomes are essential to set you apart from your colleagues and allow you to move beyond traditional boundaries for your field.